While iron is an essential nutrient for everyone, active individuals have higher needs as there is a higher rate of red blood cell (the oxygen transporter) destruction associated with activity. Additionally, many athletes are overly health conscious and may steer away from high iron foods, like beef, for health reasons, which can lead to inadequate intake. In our healthy, active population, low ferritin levels are fairly common, especially among premenopausal females. 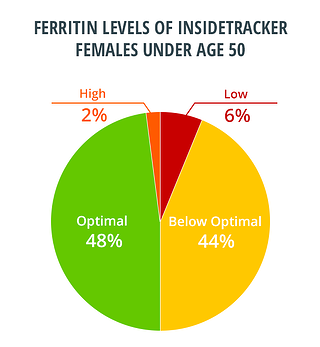 Of our users, 50% of females under the age of 50 have suboptimal ferritin levels. Like with most biomarkers, the law of diminishing returns applies for your iron markers, too. Simply put, those that have the most room to improve will improve the most. As iron levels increase, it becomes more difficult to get smaller improvements. In general, iron absorption falls from about 20% to 10% as ferritin increases from 15 to 60 mg/dL.1 Keep at it! We like to say that improving ferritin is like filling a swimming pool with a garden hose (unless it is falsely high from inflammation, of course). Choosing high quality sources of iron and being strategic with supplementation is important. Iron supplements or iron-rich meals are best absorbed when they are not taken before or after exercise. In theory, recovering from a hard run with a steak dinner makes sense since the body certainly needs to replenish some iron stores; however, since inflammation peaks post workout, it is unlikely that we are going to absorb a fair amount of that iron, thus, wasting a steak dinner! Enjoy your lean cuts of beef on easier workout days. Other good sources of iron include: shellfish, beans, dark chocolate (check the labels! ), fortified cereals, and dark leafy greens (best absorbed when eaten with a squeeze of citrus). Take your supplement before bed. This is likely to be the easiest time to have an empty stomach. Cutting off your food intake two hours before bed will also have other benefits. Have a large breakfast or lunch. Cut out your usual snack by eating more in one sitting. Small salads for lunch may sound like a good idea, but if they result in you reaching for a less-than-stellar snack three hours later, you didn’t eat enough. Go for more calories at meal times to stave off the hunger for four hours. If you need food, plan to eat a piece of fruit with your supplement. Citrus and bell peppers are winners for high vitamin C content, which helps improve absorption, and they are also relatively low in fiber. Berries are also a good source of vitamin C, but their fiber content can decrease iron absorption. Finally, and something we actually see quite often, is taking too much iron at one time. Clinically high levels of serum iron while you are supplementing can mean that you are taking too much iron at once and your system can’t do much with it. If you have high serum iron and a low ferritin level, consider breaking up your supplement into smaller doses throughout the day. A mega dose of 65mg, which should only be taken if prescribed by your physician, is unlikely to be well absorbed. We recommend starting at 14mg once per day and increasing to 14mg twice per day, if your biomarkers are not improving (ferrous sulfate is our recommended form of iron supplement). It's also important to alert your physician to your iron levels and supplementation in case your low levels of ferritin indicate something more serious. 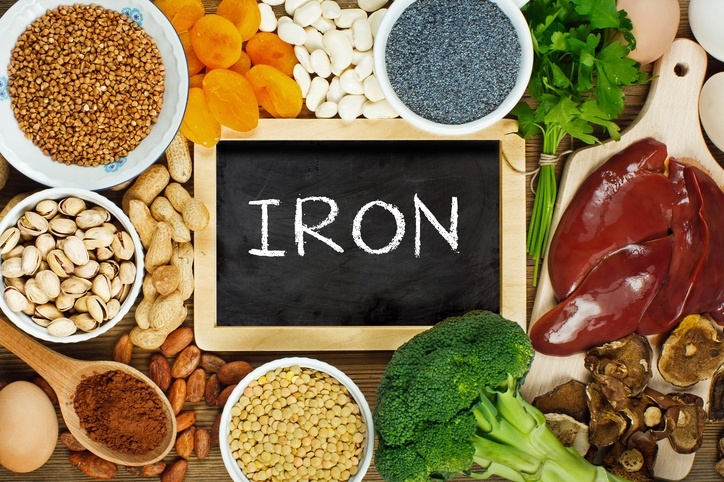 Knowing your iron marker levels is important for athletes, premenopausal females, those fighting fatigue, frequent blood donors, and anyone else generally interested in their health. But once you know them, having the tools to improve or maintain them is just as important. Fairweather-Tait, Susan J., et al. "Modeling tool for calculating dietary iron bioavailability in iron-sufficient adults." The American Journal of Clinical Nutrition 105.6 (2017): 1408-1414.